South Shields captain Julio Arca. Picture by Peter Talbot. Julio Arca has already broken Hartlepool United hearts once in the FA Cup. And the South Shields midfielder is hoping to do it all over again on Saturday – albeit with the boot very much on the other foot. Arca scored the only goal as Sunderland saw off a brave Hartlepool challenge in the third round of the competition at the Stadium of Light in 2004, kicking off a run to the semi-finals of the competition for the Black Cats. His second-half strike – scored against the run of play – ensured Sunderland did not suffer an upset against one of the lowest-ranked sides left in the cup. On Saturday, though, Arca will be part of a Shields team looking to upset the odds themselves, and claim a fourth higher-division scalp of the season to take their place in the first round proper. It’s a task the 36-year-old feels they can succeed in against their National League visitors. The Argentinian said: “We’ve got a fantastic record over the last year and we’re all hoping it can continue. “It’s a great opportunity for us to play against a really good team and try to progress in the competition. “We’ll show them respect, as we do to every opponent. “They’re three leagues higher than us, but we believe we have a chance. 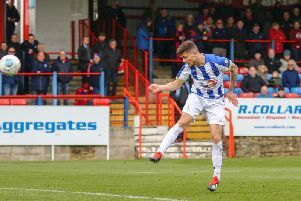 “The team has been competing very well in all competitions this season, and we put in excellent performances against Darlington and York City in the last two rounds of the FA Cup. Arca feels Evo-Stik League North front-runners Shields can play with the pressure off in front of a sell-out Mariners Park crowd. He added: “We’re happy to be playing at home, but we know they are going to be very difficult to beat. “Hartlepool had a tough start to the season but have got some confidence now, and the last thing they will want is to lose to South Shields. “I guess that like our last two games in this competition, the pressure will be more on them than us. Arca is now hoping he can be on the winning side against Pools – almost 14 years after he last knocked them out of the FA Cup. He said: “I remember there were a lot of Hartlepool fans there that day and we managed to win 1-0. “It was a very competitive game, and it was fantastic for me personally to get the winner.